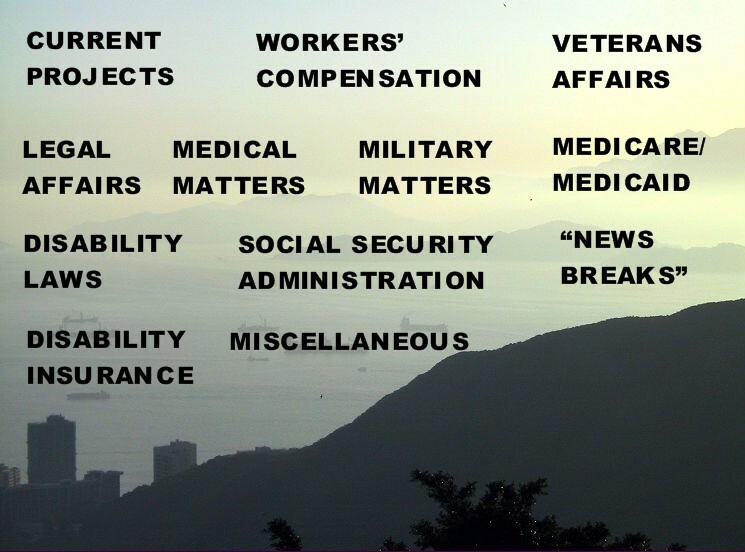 Are you bogged down in the bureaucracy and indifference of the HealthCare, Social Security, Veteran's Administration, Military medical, Legal, Disability Insurance, and Workers' Compensation systems? Have you ever been told "sorry, but you're not eligible for this program"? Have you ever heard the phrase "gap group" and has that phrase been used to describe YOU? We have been there too! The purpose of this web site is to share with others our experiences and the results of our research. Hopefully it will help you come to a better understanding of your rights and responsibilities so that you can make more informed decisions and be better enabled to seek professional guidance about your situation. We are not medical or legal professionals. We are people just like you who were lonely and frustrated trying to find help when none seemed to be available. Sign our Guest Book. The Web Site is being updated. Feel free to check back often as additional content is added. If you are in need of assistance or have a question, please Contact Us.